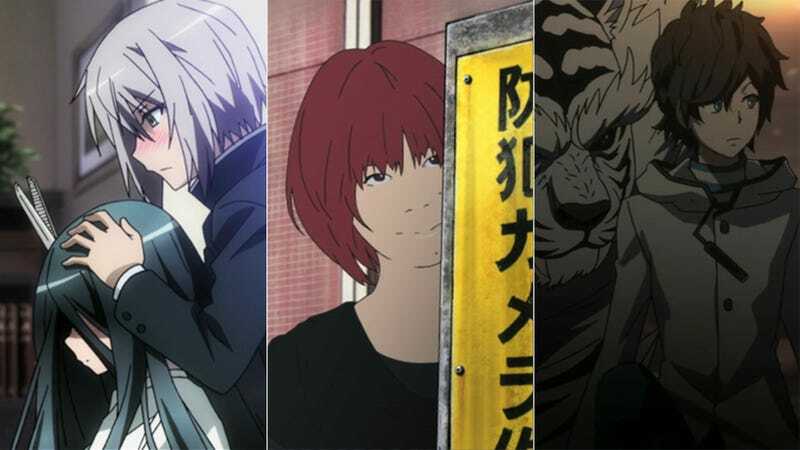 Earlier this week, we looked at the five anime you should be watching this season. But what about all the other anime this season? Well here’s why some of the more notable ones didn't make the cut. Now, keep in mind that these opinions are based only on the first half of each of these anime. A great second half could turn any of the following anime into one of the seasons’ best. And that's not to say that all the anime below are bad—though I’d argue at least one definitely is. Most just suffer from being average and don’t stand out when compared to other, similar anime in their given genre. So let’s dive in and take a look at four more of this season’s notable anime. Non-Spoiler Plot Summary: Kiri is a boy with a unique fetish: he loves to cut hair. One day he comes across a girl whose hair cannot be cut—except, as it turns out, by an ancient pair of scissors passed down through his family. But when he cuts her hair, he unexpectedly sets in motion a death game that puts both his life and hers in mortal danger. Why You Can Skip It: On one side, The Severing Crime Edge is a lightly comedic, romantic tale about two teens who find the one other person in the world who completes them. On the other, it’s about their battling a score of psychopaths coming to kill them. The contrast between this cutesy love story and staggering violence is the strongest point of the show—but very little is done with it. So while the show is not bad, there are many far better realized romance anime out there. And if you’re looking for a good death game anime, you’d be better off watching Future Diary. Non-Spoiler Plot Summary: Flowers of Evil is a slice-of-life tale about an average high schooler who, in the midst of teenage hormones and panic, accidentally steals the gym clothes of the girl he has a crush on. But before he can return the clothes, the school’s token female delinquent claims to be a witness to his theft and blackmails him into performing whatever perverted whims cross her mind. Why You Can Skip It: Flowers of Evil has gotten a lot of attention due to its use of rotoscope animation—and, no doubt, it makes for interesting visuals. Unfortunately, it is a gimmick that only hinders the quality of the anime overall. Simply put, Flowers of Evil is a long, drawn-out mess of tedium that is more concerned with showing off the rotoscoped scenery of rural Japan than telling a story. And what little story appears is nothing but useless, agonizing suspense coupled with low stakes and little payoff. Why You Can Skip It: Devil Survivor 2: The Animation isn’t “bad” per say, but it is painfully run-of-the-mill. Teenagers summoning monsters to save the world has been done to death. And unlike Persona 4: The Animation, there are no compelling mysteries nor are there deeper psychological dilemmas being explored to give the plot a unique twist. If digital-based monsters is your thing, you’d be better off watching the better seasons of Digimon. Non-Spoiler Plot Summary: When your typical (if more than a little perverted) high school student decides his tendency to lie has gotten him into too much trouble, he wishes it away at a mysterious cat statue. Of course, this forces him to say every thought that comes across his mind in pure honesty—no matter how rude or perverted. Teaming up with a girl who wished away her ability to portray emotions, the pair try to find a way to get back what they wished away. Hilarity ensues. Why You Can Skip It: While there is more than a little enjoyable humor in Henneko, there is really nothing you haven’t seen before. The basic setup is taken straight out of Jim Carrey’s Liar Liar and romantic aspects are pretty much par for the course for a fan service-filled moé/harem/romantic comedy made in recent years. And what about the anime that didn’t manage to make this or the previous list? Why haven’t I looked at them? Probably one of four reasons: 1) They were the second season of an anime and I haven’t seen the first, 2) they were far outside what I and the majority of Kotaku readers have shown an interest in, 3) I have already reviewed them, or 4) they simply didn’t cross my radar. But if you feel I have left out an anime that’s something special, feel free to give me a heads up in the comments and tell me why you feel that way. Or pop over to to Talk Amongst Yourselves: ANI-TAY and post your own thoughts on these series.